Today is your lucky day. You do NOT need a tourist visa to travel to this country. If you need information on a student or work visa, please contact the embassy nearest you. Safe Travels! Chinese citizens can get the Reciprocity Fee by following iVisa's simple Argentina Reciprocity Fee online form. The document can be obtained online in 15 minutes and must be presented when boarding your flight and at the immigration office upon arrival. Our experience of over 4 years and thousands of satisfied customers worldwide who received their Argentina Visa is the result of working with the most experienced professionals and the safest and most effective technology to process the Argentina Reciprocity Fee. Each Argentina Reciprocity Fee obtained at www.ivisa.com/visa-argentina-reciprocity-fee/ has the verification from the respective Argentina authority issuing this document. Before 2016, citizens of US, Australia and Canada were required to pay a reciprocity fee before they arrive to Argentina. But in March 2016 during Mr Mauricio Macri’s administration, it was suspended only the collection of reciprocity fee to US citizen and Argentinian born US citizens traveling to Argentina. Then, in July 1st 2017, Argentina Government announced that the "Reciprocity Fee" will no longer be required for Australian Citizens to enter Argentina. Finally, from January 1st 2018, it was suspended the collection of reciprocity fee to US citizen traveling to Argentina. A) UP TO 90 (NINETY) DAYS: Andorra, Armenia, Australia, Austria, Barbados, Belarus, Belgium, Bolivia, Brazil, Bulgaria, Canada, Colombia, Costa Rica, Croatia, Czech Republic, Chile, Cyprus, Denmark, Ecuador, El Salvador, Estonia, Finland, France, Georgia, Germany, Greece, Guatemala, Guyana, Haiti, Honduras, Hong Kong (With Passport R.A.E.H.K. ), Hungary, Ireland, Iceland, Israel, Italy, Japan, Korea Republic, Latvia, Liechtenstein, Lithuania, Luxembourg, Macedonia, Malta, Mexico, Monaco, Montenegro, Nicaragua, Norway, New Zealand, Netherlands, Panama, Paraguay, Peru, Poland, Portugal, Romania, Russian Federation, Saint Kitts and Nevis, San Marino, Santa Lucia, Saint Vincent and The Grenadines, Serbia, Singapore, Slovak Republic, Slovenia, South Africa, Spain, Sweden, Suriname; Switzerland, Thailand, Trinidad and Tobago, Turkey, Ukraine, United Arab Emirates, United Kingdom Of Great Britain and Northern Ireland, United States of America, Uruguay, Vatican city. B) UP TO 60 (SIXTY) DAYS: Venezuela. C) UP TO 30 (THIRTY) DAYS: Grenada; Hong Kong (With British Passport B.N.O. ); Jamaica; Republic of Kazakhstan and Malaysia. What is the Argentina Reciprocity Fee? The Argentinian Reciprocity Fee is the official name for the Argentina tourist visa payable by all Canadian citizens. iVisa serves as a private platform to expedite the application process. All Canadian citizens can get their Reciprocity Fee by following iVisa's simple online form. You can get this document in as little as 15 minutes and must be presented when boarding your flight and at the immigration office upon arrival. Is My Personal and Bank Information Secured? iVisa uses standard SSL encryption on all its web pages, and deploys world class security measures to protect user accounts and data. All our systems are in compliance with PCI regulations for secure processing of payments. How Can I Pay for Argentina Reciprocity Fee online? Our online application form takes only about 5 minutes to complete, and once your information is submitted and your payment is made successfully, then your documentations will arrive within 1 business day (for normal processing) or 15 minutes (for rush processing). Can I Get the Reciprocity Fee from the Airport or Point of Entry? No. As of January 2013, you are not allowed to get the Reciprocity Fee from any Argentinian airport. You have to pay online! Why Do I Need to Apply for the Argentina Reciprocity Fee? In 2009, the Government of Argentina instituted the Reciprocity Fee for all Canadian citizens. It is said that this fee is maintained to support the local tourism economy. What Is the Validity Period of the Argentina Reciprocity Fee? Is There Any Difference Between Getting the Visa for Argentine and the Argentina Reciprocity Fee? The Argentina Reciprocity Fee is only applicable to citizens of Canada.. For all other countries, please check our Visa Requirements page. Depending on your citizenship, you may be granted visa free entry, or have to apply for visa before you can travel to the country. Can I Change Any Mistakes I Made While Entering My Passport Number? Yes, as long as you process your visa application from the iVisa website. Send us an email immediately upon realizing the mistake and we will apply the changes. NOTE that you can not change your passport number. You will ned to apply again if you entered the wrong passport number, all personal info can be changed if possible. HOWEVER, if you’re applying for the Reciprocity Fee from the government’s website, you may need to contact them directly to make the changes. How Do I Get In Touch with iVisa? You may chat with iVisa directly using the live chat feature on our website (online) and discuss your questions and concerns. Alternately, you may email (help@ivisa.com). Can I Get Refunded on the Reciprocity Fee? Yes, but only if the Argentina Reciprocity Fee has NOT been processed. Please note that the Service Fee is NONREFUNDABLE. Getting the Argentina Reciprocity Fee through our rush service means that all the fees are NONREFUNDABLE. As long as your Argentina Reciprocity Fee is valid, you may travel to Argentina at any time in the future, with exceptions only applicable on travelers who were born in Argentina. In this case, proof of birth must be submitted via email to allow us to process your refund from the Government of Argentina. Note that the refund process may take up to 30 business days and is issued on the same credit card you used to make the payment. When should I Expect My Visa to Arrive? When you process your visa application from iVisa, you should get the visa within 1 business day, and within 15 minutes for rush service. How Do I Check If I Have Paid the Argentina Reciprocity Fee If I Have Traveled to Argentina Before? If you traveled to Argentina before 2010, you may not have paid the Argentina Reciprocity Fee since it was implemented in that very year. If you traveled to Argentina before 2013, you may check your passport for the Argentina Reciprocity Fee stamp. After 2013, you may ask us or the government for the documentation. As long as you hold a valid Argentina Reciprocity Fee, you may travel to Argentina anytime within the validity period. Can I Show a Copy of the Argentina Reciprocity Fee from My Phone at the border? Is This Website Affiliated with the Government of Argentina? IVISA.com is not affiliated, nor related in any way to the Government of Argentina. We are a private organization that makes it easy for people to apply for Argentina Reciprocity Fee online. Why do I need to pay a Service Fee? The iVisa service fee is the primary source of revenue on our website, and helps you fast track the visa application process for visa or Argentina Reciprocity Fee. The fee is only $20 and helps you eliminate the hassle of government bureaucracy. 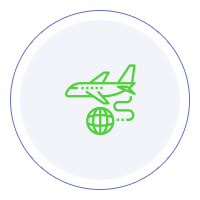 Which nationalities does iVisa's Argentina service work for?